​Ekphrastic is a Fibre Art Network of Western Canada (FAN) exhibition scheduled to travel from Oct 2016 to December 2019. The Ekphrastic exhibition is a unique showcase of the collective talents of Canadian poets and fibre artists. The word ‘Ekphrasis’ means a rhetorical device whereby one medium of art is created to relate to another medium of art. Usually Ekphrastic poetry is created to respond to a piece of art. FAN put a distinctive spin on this process by inviting twelve well known Canadian poets to contribute a poem of their choosing. Each of the twelve poems were interpreted by four FAN members in a wide range of styles, as you can see here with these four images being a response to a poem by Jennifer Still, also titled, October. Recent addition to our collection. 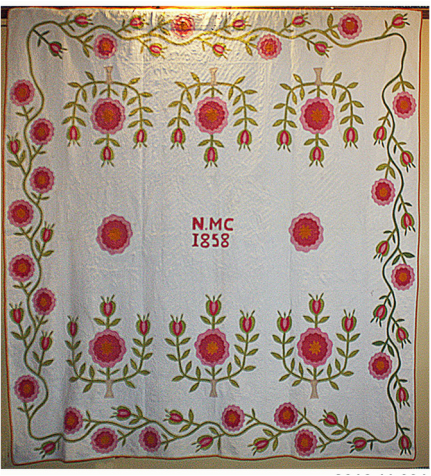 Made by NMC; dated 1858. Enjoy the Gaches Mansion dressed for a Victorian Christmas with quilts and textiles from our permanent collection. Explore all three floors decorated with trees and textiles popular during the long reign of Queen Victoria (1837-1901). On display on the first floor will be quilts and textiles dating from the 1840s and into the 1850s including the beautiful hand stitched red & green applique quilt, an 1860s Civil War Album quilt, and quilts from the 1880-90s. Some of the quilts on display are seen at right. As a special treat, please spend some time in our Landmarks Gallery where you will find handmade dolls by local artists Gloria Burke, Carol Walker (see Flora Dora. below), and Mardi McLaskey. Each artist has their own unique spin on their creations and the work includes everything from sweet sophistication to Prim dolls. We will also be including dolls from our collection. The main exhibit is the Path to Edo (Tokyo), depicted from the old picture scroll of the shopfronts in Nihonbashi around 1805. I was prompted to create the shopfronts of Nihonbashi of Edo era after seeing the old streets of Paris in textiles and embroidery. Many of my students participated, took a great deal of effort by checking the storehouses, the river and the order of the shops, and as a result, we were able to create a delightful scene of Nihonbashi. We recently added the merchants, visitors, and others to make it more lively. A Happy Ending!! Please enjoy the scenes of Japan 200 years ago. We cannot throw away pieces of silk, however small, as they teach us history of Japan. We have joined many to make a bolt of fabric to make a kimono. Ako Shimozato and Glenys Baker. Red and Violet by Sachiko Yoshida. ​Forty years ago, American patchwork quilts were introduced to many Japanese and the colorful quilts brought much joy to them. When silk was used to make quilts in Japan, it became the Japanese specialty and brought much attention. The silks we use to make the quilts are from very old kimonos that are taken apart because they could no longer be used as wearables. The pieces of silk are revitalized as patchwork quilts. My students took much time and effort with respect to the fabric to create the quilts.They are original creations with designs, colors, and appliqués of flowers and vegetation. We appreciate the opportunity La Conner Quilt and Textile Museum has provided us in exhibiting the Japanese quilts. Because of the efforts of the staff and the volunteers of the Museum, many will witness our show and we are deeply grateful. Quilt made with Obi Sash by Reynola Pakusich. Reynola Pakusich is a third generation member from a family of quilters who settled in Eastern Washington and Idaho. She began quilting seriously in the 1970's and teaching for quilt shops shortly afterward. She has had numerous photos of her quilts published in books and magazines, as well as several one woman shows. Reynola retired from 30 years of public school teaching in Sedro-Woolley School District and now combines quilting with her husband’s interests of fishing and hunting (i.e. paper piecing in a car, boat, on a ferry or working by gas light at a lake cabin.) 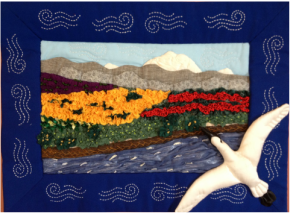 Residing in Bellingham, Washington, she is an active member of several Northwest Washington quilt/study groups and continues to take workshops, attend lectures, and experiments with the latest techniques to keep herself on the cutting edge of the craft. At the 2015 Quilt & Fiber Arts Festival, a challenge was issued to create a work of art using two pieces of fabric designed by Jane Sassaman. ​The biennial Quilt Studies have become a popular part of the American Quilt Study Group’s activities. Participation is a voluntary undertaking by AQSG members. 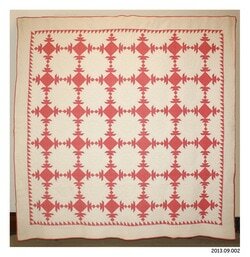 Responding to a selected theme, a quilt is created which is copied from, or inspired by, an existing antique quilt. Each Participant is asked to provide an image of their inspiration and write a statement describing why they chose the inspiration quilt; the techniques used to construct their own quilt; and what was learned in the process. 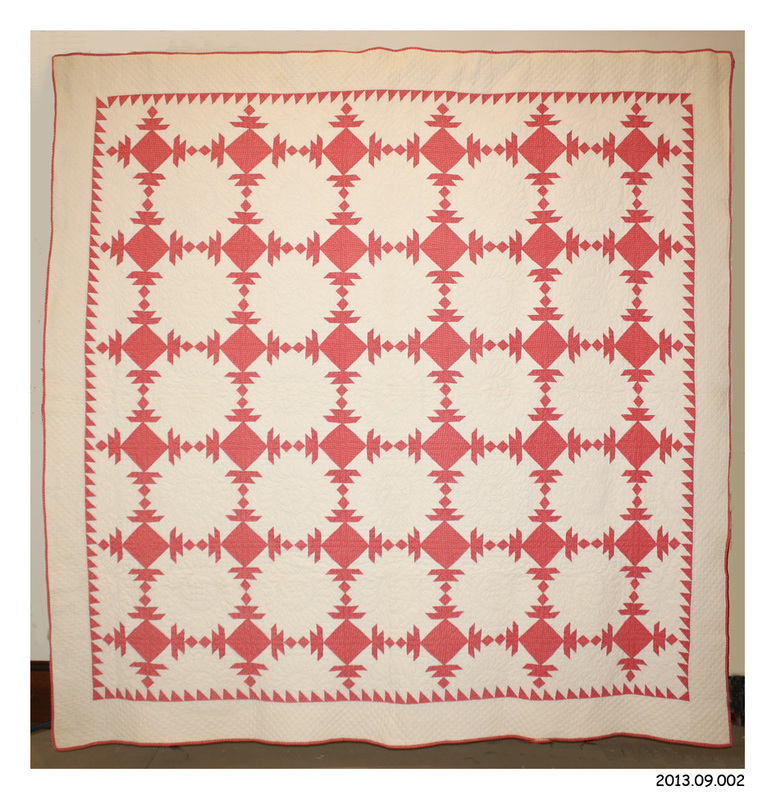 This 2012 Quilt Study theme was Colonial Revival Quilts from the Early 20th Century. All inspiration quilts are required to be recognizable as quilts from the period regardless of the techniques used to make the original quilt. 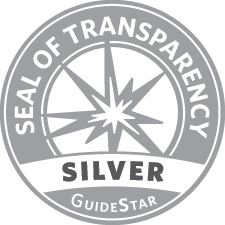 It is up to each Participant to determine their own construction methods for their projects based upon information available about the original quilt. All of the completed Study Quilts are exhibited at AQSG Seminar at which time we ask three AQSG members to serve as a selection committee. Their task is to determine which of the study quilts will travel throughout the United States for approximately two years. Young Lady in Bloom by Janet King. Image by Michael Stadler of Stadler Studios. The oldest form of making fabric, contemporary felters have taken this art form in a whole new direction. Taking loose fibers and manipulating these fibers through various processes the artists can create a flat surfaces, 3-Dimensional, and even garments. Many thanks to Zia Gipson for help in organizing this exhibit. 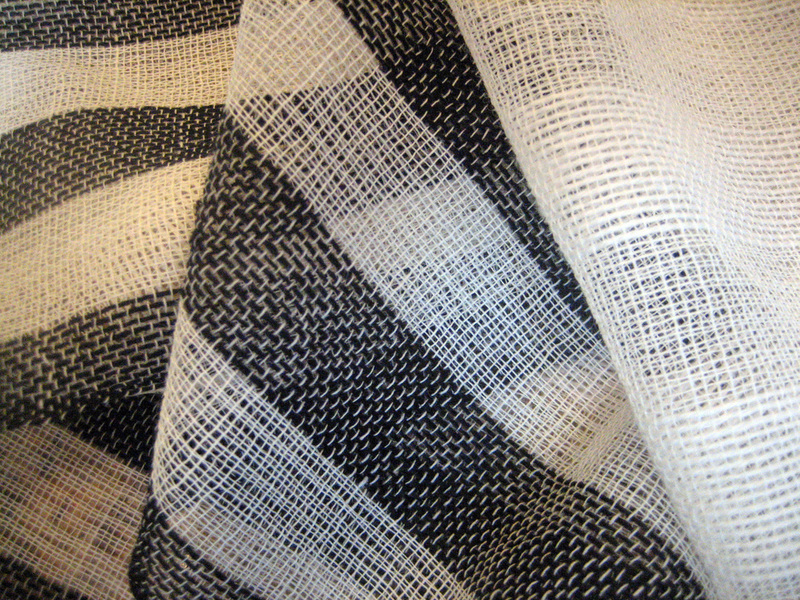 Black and White Weaving (detail) by Mary Burks. Today, most of our textile needs are supplied with commercially woven cloth. However, there are still artisans making cloth on hand looms, in home studios, or small weaving businesses, keeping alive the skills and traditions of the early weavers. My work is traditional in technique, and pictorial in style. My quilt tops begin as a sketch, which I enlarge to the size of the finished quilt. About 75% of the finished quilt will resemble the sketch as I work out each little area or character, listening to the fabric and how it can best reveal the heart and soul of the piece. Hand appliqué is my technique of choice. All my edges are turned under and appliquéd, usually with silk thread. I love the rhythm and serenity it gives me. I love being able to easily rip it out when a new idea or inspiration carries me away. I love honoring the generations of women who have gone before me and share this passion. 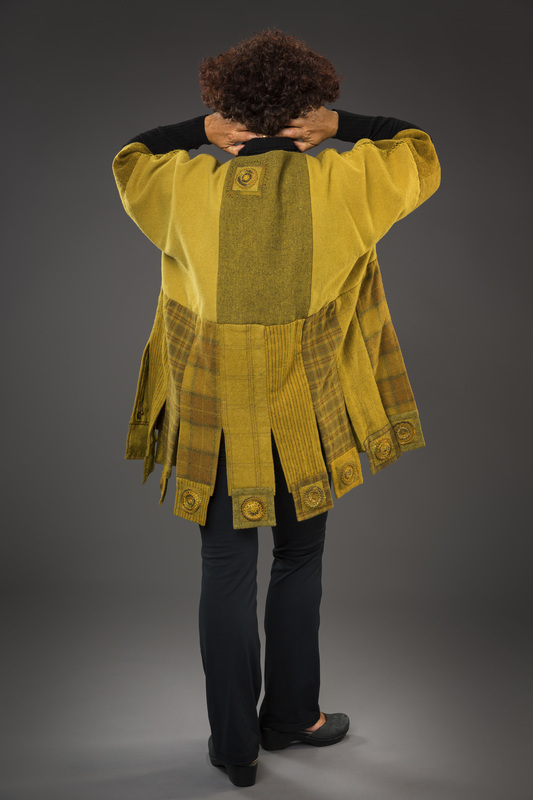 ​This exhibition presents a collection of garments created during the past three years that speaks to my personal journey as a woman of eighty-three years. Every woman has a story and I believe growing older is an adventure unlike any other and that philosophy is the inspiration of my work. Making clothing is my passion and I want to celebrate my life and my years with what I wear. I don't believe in age-appropriate dress but want to make a personal statement about who I am and what I cherish. This collection honors the women before me, the magical places I have traveled and the importance of celebrating the moment. I want to age with independence, dignity and purpose and wear clothing that represents that philosophy. ​Moving to Ohio 25 years ago from Wales, UK and unable to work without a Green Card, I took up quilting and volunteer work to fill the days while my husband was working. When I did get a Green Card I was too busy to work. Ohio had an excellent quilting community and I was able to learn various quilting techniques focusing on hand applique. 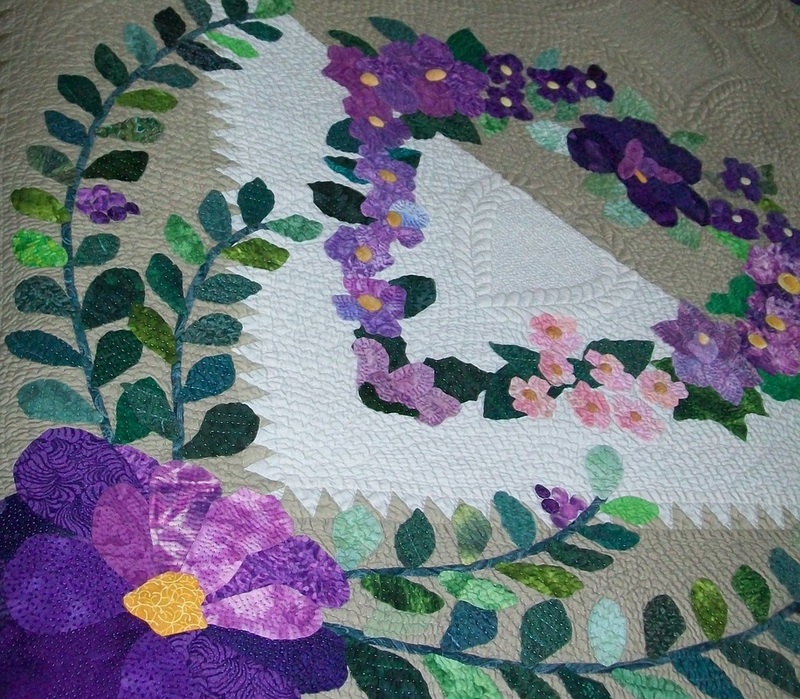 A nearby Amish community was also an inspiration with their handwork and hand quilting. When my husband retired and we relocated to Bellingham, I found the quilting scene in Washington to be just as active. More recently I have enjoyed the handwork of piecing hexagon quilts. Volunteering at La Conner Quilt Museum has given me access to a great variety of quilting inspiration and a great team to work with. I consider myself a ‘hobby quilter’ and have taken various classes at the museum to increase my skill level. It is an honor to be asked to show my hexagon quilts at the museum and I would like to thank Dani Fisk of Blaine for doing the beautiful machine quilting on several of the quilts. Quiltmaking in urban areas slows down during the last decade of the 19th .The Crazy Quilt fad of making highly decorative embellished silk quilts was diminishing and readymade blankets were inexpensive to purchase. Still, quiltmaking remains popular in rural areas and cotton became the desired fabric choice for quilts. At the end of the 19th century, colors available for quilts were somber. The first successful black dye for cotton was in the 1890s--wine, navy, black, gray, red, and blue round out the color choices. But a lighter color scheme was about to take hold. ​The La Conner Quilt & Textile Museum has issued a Challenge to use the phrase "Flights of Fancy" as your inspiration in a small fiber art piece. We got some wonderful pieces submitted and many of them are available for sale! 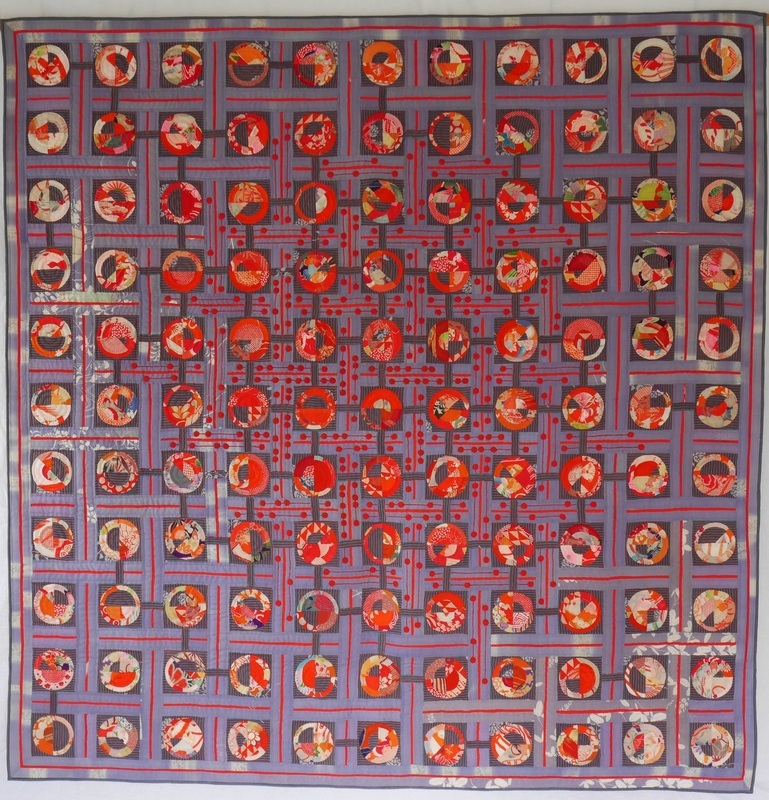 ​Donna Hanson Eines, a native of Seattle, Washington, began quilting in 1974, and entered her first quilt, (Cathedral Window) in the 1975 Island County Fair in Langley, Washington, Imagine her surprise when that first quilt was awarded a beautiful Best of Show ribbon and an engraved silver plate. This launched the beginning of Donna’s prolific quilting career, and in the years since that first Best of Show in Island County Fair, she has won numerous best in show awards, and created an extraordinary collection of quilts of all sizes and styles. ​Donna’s quilts have also appeared in national magazines, including Quilter’s Newsletter, Quilt World, Good Housekeeping, Quilting Today, and Ladies Circle Patchwork Quilts, with several publications featuring cover photos of her quilts. 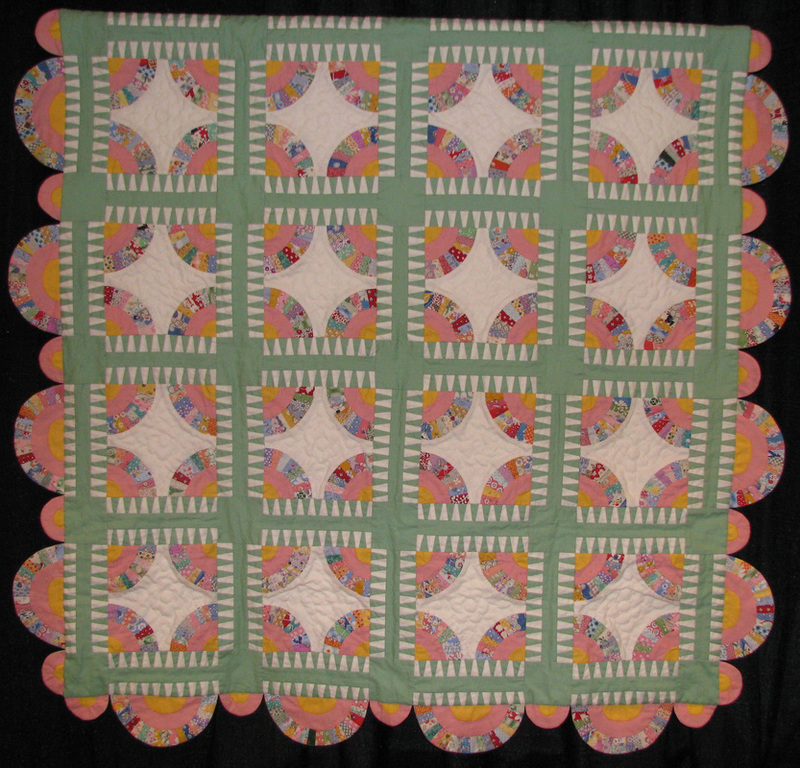 Additionally, Donna’s quilts have appeared in numerous books, including several published by That Patchwork Place, The Quilt Digest, Powel Publications, Weaver-Finch Publications, and Oxmoor House. 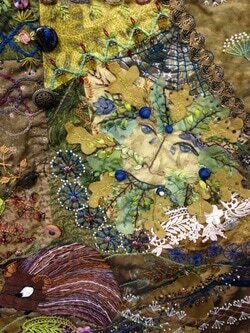 Art quilter Janet Steadman’s piece, Branchlets, features amazing piecework that is combined with meticulous machine quilting. Other artists working with fabric may also include hand work, such as the work by Carol Barton Jerome and Bergen Rose; who add hand stitched details to enhance their work. Working with paper, Marie Plakos has created Ceremonial Vessel, a 3-D sculpture made of cast paper. Criss Cross, by feltmaker Zia Gipson, was made using the Korean paper felting technique called, Joomchi; creating a unique layered paper art piece. 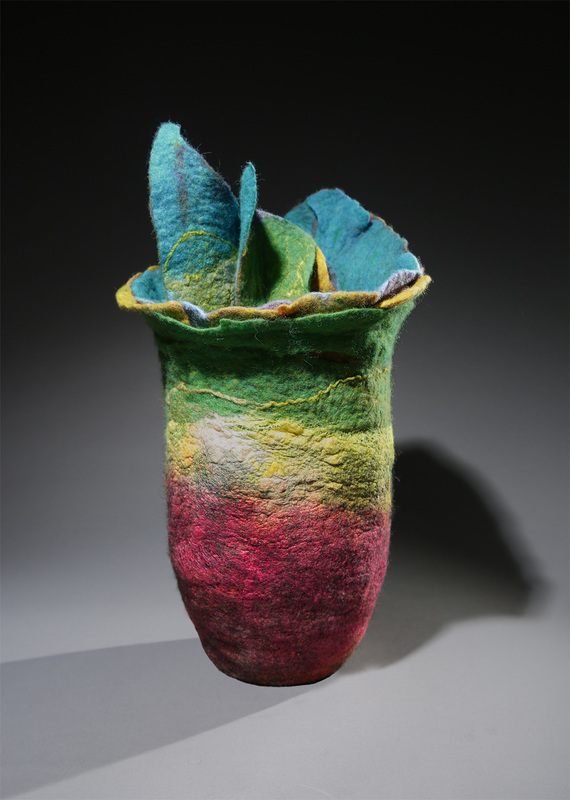 Janet King and Ilene Rae Sorenson have created dimensional pieces using felted wool. Basket makers, Danielle Bodine and Nancy Loorem-Adams, are working with traditional basket making fibers, but then use other elements such as mulberry paper, clay, or feathers to finish their work. Another artist working in 3-D is Larkin Jean Van Horn however she is using beading to create her work. Chameleon, by wearable artist Fine Gelfand, was created using sheer fabrics to encapsulate elements, with added sequins and threadwork to enhance the details. 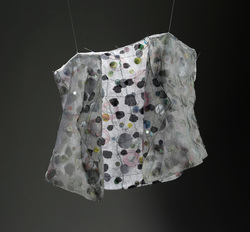 Cheryl Kamera and Kristin Lasher use hand-dyeing techniques when making their garments. 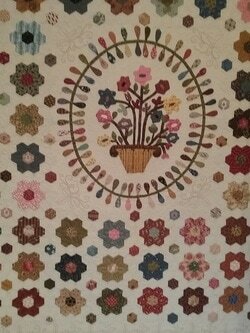 Crazy Quilt by Annie Pickens Mehrhof and friends. 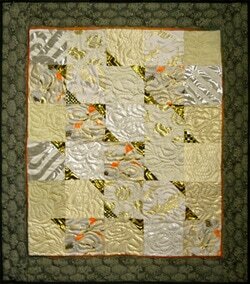 ​We start each new year with a selection of embellished quilts. One style of hand embellished quilts includes Crazy Quilts, a fad that started around the 1880's when American quilters picked up needle and thread to create these highly embellished quilts. The style usually features random-sized patches sewn onto a foundation fabric but a few might include fans or other recognizable patterns. The edges of the patches are often covered with embroidery stitches. Sometimes the patches may include paintings, ink work, or additional embroidery work. At left, Crazy Quilt, Annie Pickens Mehrhof and her friends, dated 1885. Medieval Scene, detail, by Elise Olsen. La Conner Quilt & Textile Permanent Collection. ​What is Needlepoint? Traditionally, needlepoint has been embroidery done on canvas, using wool to execute the tent stitch. 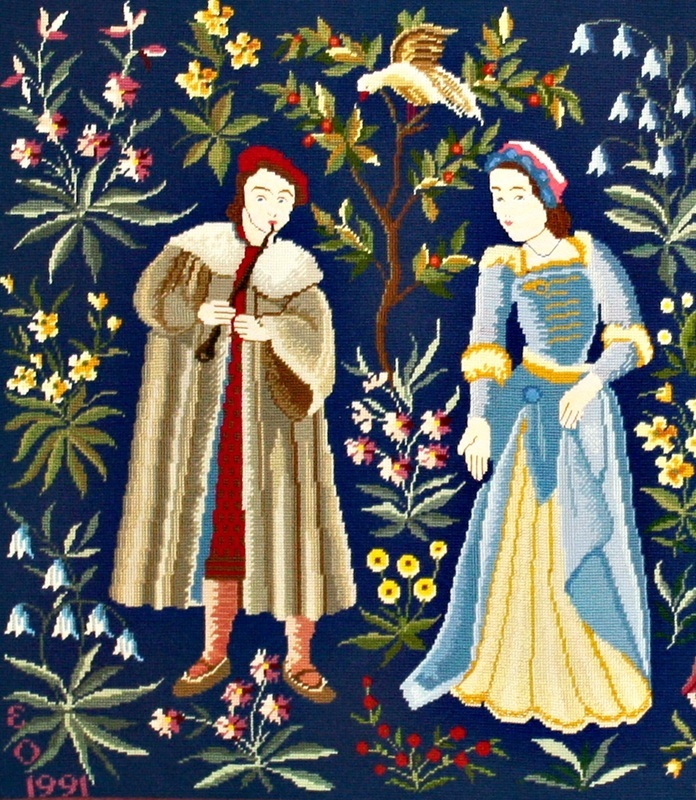 While such embroideries are needlepoint, today’s needlepointer has available a much broader palette of stitches and techniques. American Needlepoint Guild defines needlepoint as "any counted or free stitchery worked by hand with a threaded needle on a readily countable ground." This progressive definition encourages creativity through a traditional and contemporary approach to needlepoint. Meet local needlepoint artists and see their amazing, hand-stitched work. The Anacortes Guild is a chapter of the larger Needlepoint Guild of America Incorporated. Also on display will be needlepoint pieces from our permanent collection. Assistant Guest Curator, Diane Brosten. 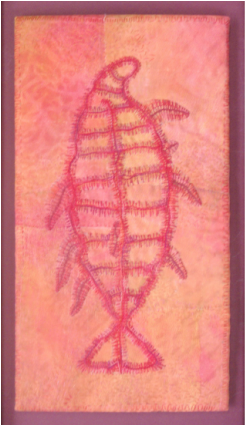 Local fiber artist, Anne Middleton's hand stitched work has been focused on Northwest Rock Art; her recent work features petroglyphs and pictographs. Anne’s long fiber history began at her father’s knee– a man who saved string, cord, and leather – who hand-repaired saddles, harnesses, bags, and other heavy stitched gear. Anne’s grandmother was a quilter, also stitching by hand, making intricate embroidered designs to join crazy quilt panels passed down in her family. Yet a third creative thread came through Anne’s mother, a painter of furniture designs in Los Angles’ international district in the 20s and 30s. Anne began taking textile classes with Anita Luvera Mayer and others, and upon retiring, was fortunate to study the art of hand-stitching at Gail Harker’s Center for Creative Arts, completing the 200-level Creative Hand-Stitch course. During this time, Anne came upon the fascinating images of Northwest rock art, both petroglyphs (etched) and pictographs (painted). Using these designs provided for her the perfect melding of textile art and cultural anthropology. She feels it is an honor to share these striking but not-so-well-known motifs through her work. 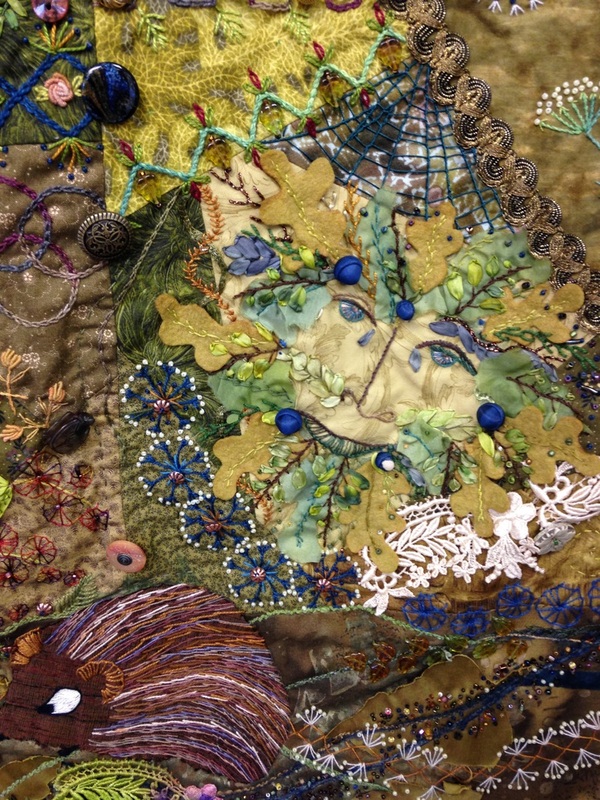 January 6 - 31, 2016Local Crazy Quilt artist, JaNita Clairmont, creates wonderful, whimiscal quilts. Each a unique work of art, JaNita uses fabric, lace, thread, and beads to bring her work to life. 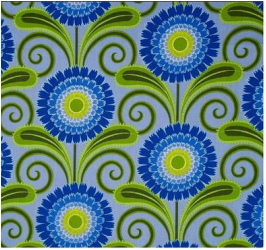 I started quilting in 1976 with the Bi-centennial resurgence in quilting and traditional crafts. Like so many, I started out with a sampler quilt and worked my way through Log Cabins, Attic Windows and I really thought I was special when I made my first Mariner's Compass! I joined a local Guild and 17 years ago, started teaching.